"Dr. Sears explains the early stages of infants crawling then walking>"
As an infant-development watcher for over 50 years, I have noticed there are three influences that impact when your child crawls and walks. It's important for every parent to understand that each baby is unique, and so their timing on when milestones occur will be individualized. Our second son, now Dr. Bob, skipped the crawling stage entirely. He scooted his way around the floor from 7 to 9 months until he learned to pull himself up next to the couch and cruise around it, and then he leg go and started walking at 12 months. Some of our other children enjoyed staying in the crawling stage for several months and tended to walk later. Again, a baby's style and age of walking is as unique as their personality. Line up 10 beginner crawlers on walkers at the starting gate and watch them make their individual ways around the track. They all reach the finish line, but with different styles and at different speeds. Although no two babies crawl and walk with the same style and at the same rate, most follow a similar sequence of development. Early walkers also tend to be more accident-prone, often acting before they think. If you have an early walker or crawler, go on a safety patrol. Get down on your hands and knees and crawl around your home playing like you're a beginner crawler or walker. Notice potential sites that could injure baby, such as table corners to fall against, lamp cords to pull on, and so on. Either place protective covers on the edges of your furniture or store the pretty, yet sharp, stuff in the garage for a couple years. For the beginner crawler, use soft toys so if they fall fglat they don't land on an uncomfortable wooden, metal or plastic toy. The styles of beginner crawlers are variable. Some babies inch-worm along the floor, others crab-crawl by moving more backward than forward, and others enjoy making a bridge with their xtended legs and arms and then leap-frogging forward. When you see your baby making a bridge, that's often the first sign crawling is soon to happen. "When will my baby walk?" is a common question I get in my medical office. 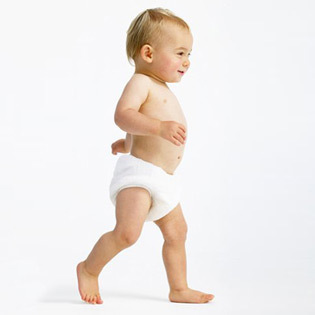 About 50 percent of babies walk by one year of age, yet there is a wide normal range for walking: from 10 to 15 months. Beginner walkers have to coordinate three developmental factors: balance, muscle strength and temperament. Keeping in mind that progression is more important than timing, the "worry word," if you need one, is plateau, meaning that baby's walking is not only late, but there has bee no progression over three months. For example, if at 15 months baby is no closer to walking than when they were at 12 months it's certainly worth reporting to your baby's health care provider at the next routine checkup. Instead of looking at developmental charts on when babies "are supposed to do what" and worrying that your baby doesn't fit the chart, enjoy your baby's individual style. If wondering what developmental schedule your baby is on, think "her own." Here's a memory that will last a lifetime. Keep your cellphone or notebook ready and record humorous highlights of your baby's developmental milestones. Each day we would record at least one entry which we dubbed "catch of the day." We would then present our children with their own "baby book" once they started a family. When our adult children, now parents, talk about their babies' milestones, they can look back at their own book and say, "Let's see what I did at this stage." Visit HLMS.com for Dr. Sear's tips for ways to have fun with your baby's advances. This article was written by Dr. Bill Sears, M.D., father of eight and the author of 42 books on family health, including "The Healthiest Kid in the Neighborhood." A practicing pediatrician for over 40 years, he is an Associate Clinical Professor of Pediatrics at the University of Calfornia, Irvine, School of Medicine. Dr. Sears is a fellow of the American Academy of Pediarrics (AAP) and a fellow of the Royal College of Pediatricians (RCP). I hope you found this article onPrecious First Steps to be helpful. I also hope you take this opportunity to visit my website (store). We offer Hotslings Adjustable Pouch, Rockin Baby Pouch, Rockin Baby Ring Sling, Seven Everyday Slings, and Lil Cub Hub Convertible Baby Carriers in a wide variety of fabrics and colors. Thank you for visiting my blog and hopefully also my website.